Exquisite and sophisticated – Blue pearls. They are a great accessory that will go with any attire, from your casual blue jeans to professional business attire. They accentuate any look and any style! 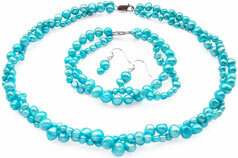 Looking for a nice blue pearl jewelry set or just a bracelet? You`ve come to the right place! Whatever kind of blue colored pearls or pearl jewelry you need, we’ll have it for you! What kind of Blue Pearls do we have? Do you prefer royal blue or do you like a darker shade of blue? 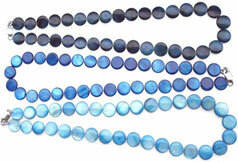 Whatever shade or tone you need for your blue pearls, we can always process any shade of blue just for you! 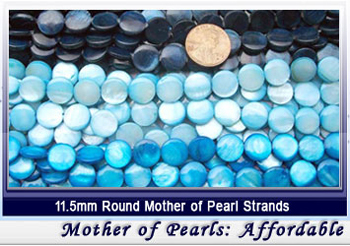 Our pearl strand starts from $1.87/strand. For a cultured blue baroque pearl necklace and earrings set in 925 sterling silver, it’s only $28.99, lower than a retail jewelry set. Comparing it with other retail and online stores, you can see that our prices are considerably cheaper. The most common question people ask us is “why are your prices so much better than others?” The answer to this question is that we own pearl farms while many of our competitors do not. Without the Internet, we would never have had the opportunity of serving you directly online from our pearl farms. We would be still only available to business vendors and store owners at trade shows and conventions. Looking to buy loose pearls? 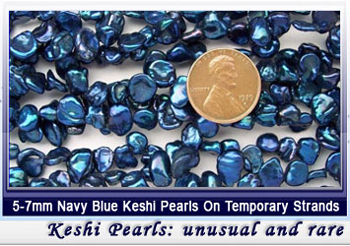 Looking for half-drilled individual blue colored pearls or blue pearls on temporary strands in any shape? Then you’ve come to the right place. Find them all here! 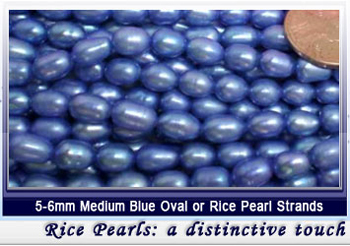 We have any kind pearl in blue color in any shape: round blue pearls, blue button pearls, blue rice pearls, nugget pearls, potato pearls, biwa pearl strands, top drilled peanut blue pearls, and also in various sizes. Is there any specific kind of blue pearl jewelry you are looking for? You can type “blue” in the Search Box on the right side with product category or price range to find a specific item. Our in-house workers and designers make jewelry for various stores and exclusive jewelry lines. Why not have them make aunique piece just for you? How about a fine pearl jewelry custom made for you or a friend or even your bridesmaids? You can specify any shape, size, and grade pearls for customization. You can look good in your wedding dress for less! What are the things to consider when buying blue pearls? Consider the many shades of blue when making your blue pearl purchase. What shade of blue do you like? 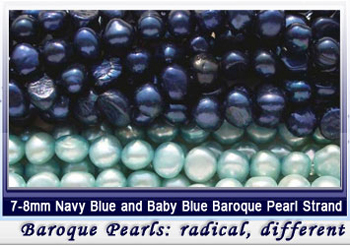 Our pearls come in many shades including light blue, baby blue, and navy blue. We have a huge variety of hues and tones to choose from. Also consider the size of the pearls that you want. Smaller sized pearls look good on girls and young women; bigger ones look better on adult women. These pearls can match almost any attire and they`re suitable for all types of skin. It makes a great gift for yourself or for your sweetheart! You can order any kind of blue pearls, complete with any one of the pearl clasps from our store for a fine piece of jewelry at the lowest wholesale cost from our store. It will be guaranteed to be treasured forever!